He handed me one of the pieces of ivory-gray and brown-streaked bone. I took it in both hands, afraid I might drop it or accidentally break one of the glass cabinets behind my shoulder. The stump of the antler, where it had once attached to the elk’s skull, was nearly as big around as my forearm. From point to burr, it looked about 4 feet long. It easily weighed 10 pounds. And it was part of a matching pair. Elk, deer and moose drop their antlers and paddles every year in the early spring and grow them again in time for the rut in the fall. Moose can start to shed their paddles as early as November, while elk drop their antlers late in the season, closer to April and May. With all those racks dropping every year, it seems like finding them should be as easy as a walk in the park. But somehow it’s never that simple, even for the best hunters. It’s all in the art of understanding animals —where they eat, where they winter. Some people, like my friend, have perfected the art well enough to turn it into a part-time seasonal job. But for most, finding a six-point elk shed could be the find of a lifetime, requiring hours and days of work and plenty of miles traveled to reach remote areas as the hunt heads out through dense sage, scrub oak, brush and timber. Good shed grounds become well-kept secrets. My own first taste of shed hunting came while fighting a fire outside of Blackfoot, Idaho. The land through which the fire swept was rolling swells of sage and grass. Shelves of rock cut through the soil terracing the hills, and where the earth tucked back in on itself, groves of aspen sprouted. The fire moved fiercely through the gentle landscape. It slicked off hundreds of acres, reducing grass and trees to a carpet of ash. Across the flattened terrain, deer and elk antlers started to reveal themselves. Large and small, old and new, some broken, some in perfect pairs, their tongs stuck up from the smooth ground like beckoning fingers. Animal mortality during normal winters is already high, with 40 percent of deer fawns, 20 percent of elk calves and even 10 to 20 percent of full-grown adults succumbing to winter stress. By the time shed hunters come out in spring, these animals are down to their last reserves of fat, waiting for warm weather and new vegetation. In this tenuous state, getting spooked by people could be their last act. To combat the problem, in 2009, Utah instated a mandatory online course in antler-gathering ethics. Those who pass are issued a free license to gather sheds. 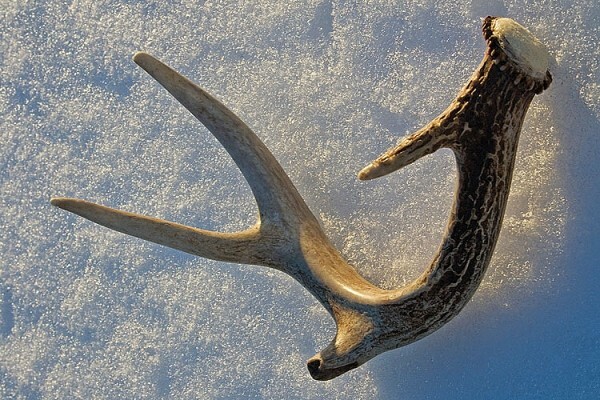 Anyone caught shed hunting without a license faces a fine. We found dozens of pairs that day outside of Blackfoot, and we left them all. But, for me, the bug had bitten. The next spring I went out into the hills around Salt Lake City where I had seen sign of elk before. I looked along fence lines and ditches where antlers are likely to fall, jarred loose by a jumping bull. I trained my eyes on sticks, knowing that an antler could easily be mistaken for a weathered branch, but nothing appeared.